All speed bags are punching bags, but not all punching bags are speed bags. In boxing parlance, punching bag is the generic term applied to all such tools, but most "civilians" mean a standard heavy bag. Both heavy and speed bags can produce health benefits if used correctly as part of a systematic regimen. When you strike a heavy punching bag, the weight of the bag meets your attack with resistance. This forces your muscles to work harder. In response, those muscles grow stronger. This won't be the bulky strength of a weightlifter but can become the lean, powerful muscle of a swimmer. Such muscle improves punching power, but can also build up your balance, coordination and endurance. Working the heavy bag is also cardio conditioning, especially if you're working the bag for continuous two or three minute rounds. 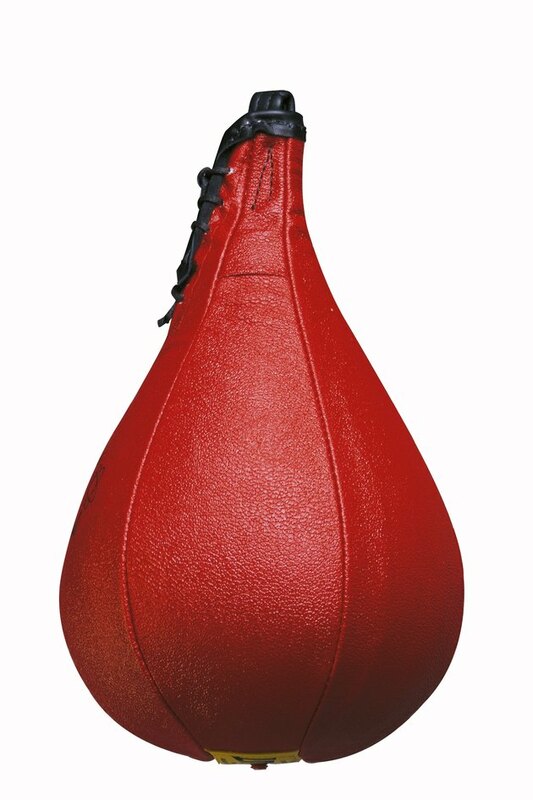 Where a heavy bag develops power, a speed bag develops skill. Striking a speed bag in a workable rhythm requires focus, coordination and speed. It's also an impressive cardiovascular workout, which can improve your circulatory health and reduce your risk for heart disease, high blood pressure and similar disorders. The improved coordination may also help you in everyday life. Hitting a punching bag feels good and may relieve stress. Stress, according to Dr. Walter Willett in "Eat, Drink and Be Healthy," is an exacerbating factor in nine of the 10 top causes of death in America. Reduced stress can come from punching any kind of bag. Punching bags, used as part of a martial art training regimen, can also help improve your balance and stability by improving the technique of your strikes and movement. Both bags also enhance hand-eye coordination. The heavy bag swings and you have to adjust your movements and your punches around the movement of the bag. The speed bag has the same effect, just at a greatly accelerated speed. Many of the potential benefits of working a punching bag come only if you use it regularly and systematically. You can't just play around on the gear for a few minutes. One common structure used by competitive martial artists is to work on the bag in rounds similar to those used in competition. You can attack the bag for two, three or five minutes at a time, and rest for one minute between rounds. This keeps you focused on the exercise and increases the likelihood of your getting a beneficial workout.